Promised features like eSIM and Always Connected PCs could debut on the Snapdragon 845-powered 'Cheza' Chromebook. More unverified code in Chromium have shed some light on the unannounced model including the potential for a 1440p or 2160p display and an integrated X20 modem. A Snapdragon Chromebook would compete directly with Microsoft's plans to launch Windows on ARM. HP is one of the very few OEMs with detachable 2-in-1 Chromebook designs. The HP Chromebook X2 is a derivative of the Pavilion X2 and both share very similar features as a result. So far, however, there have not been any HP Chromebooks powered by a Snapdragon SoC. Recent rumors are suggesting that this could soon change with the discovery of the codename 'Cheza' earlier this year. Newer rumors have emerged this week detailing some core specifications of the unknown 2-in-1 Chromebook including a 2560 x 1440 resolution display, Snapdragon 845 SoC, and an integrated X20 modem. If the Snapdragon SoC turns out to be true, then this 'Cheza' Chromebook will likely be an "Always Connected PC" that Microsoft and Intel had been boasting since 2017. This means that the Chromebook will always be connected to a wireless network no matter where it is taken similar to a smartphone. Other expected features include USB Type-C, USB Type-A, DisplayPort, and either eSIM or a traditional SIM slot. 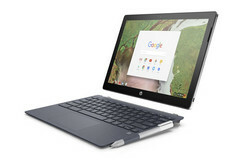 It remains to be seen when HP will officially announce the 'Cheza' Chromebook. Meanwhile, Microsoft has been preparing Windows ARM PCs powered by the upcoming Snapdragon 850/1000 made to compete directly with the Google Chromebook.